Shariah doctrine crushes women’s liberty. Rifqa was born on August 10, 1992, in Sri Lanka, and she drew international attention in 2009 when she ran away from Ohio at age 16 from her Muslim home, having converted to Christianity. As with all these stories, Rifqa’s story is based on the public record. Rifqa Bary attended New Albany High School. At the school Rifqa was a Straight A Student, a Cheerleader, and a member of the Track and field team. During her spare time she wrote poetry and took guitar lessons. Bary’s parents have said that they are Muslims and pray five times a day. The Bary family had attended the Noor Islamic Cultural Center (NICC), near Columbus. Rifqa became a Christian in 2005 when she was 13. In July 2009 she ran away from her parents’ home to the home of Orlando, Florida Christian pastor Blake Lorenz and his wife, Beverly with whom Rifqa had communicated on Facebook. 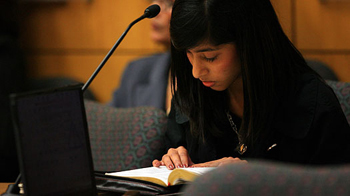 Rifqa had told Beverly Lorenz that her parents would kill her for converting to Christianity. She appeared on television and declared that her father said, “He would kill me or send me back to Sri Lanka,” describing herself as the intended victim of an honor killing. Rifqa was taken into custody by Florida child welfare authorities while an investigation was conducted. On October 13, 2009, the judge ruled that he would return Rifqa to Ohio pending a settlement of her immigration status, and in 2009 Rifqa returned to Ohio and was temporarily placed in the custody of Franklin County Children Services. She would turn 18 in August 2010, and she wanted to stay away from her family until that time because of her fears of their reaction to her conversion to Christianity, which she continued to believe in and to practice. On December 22, 2009, a magistrate of the Franklin county juvenile court denied Bary’s parents’ request for forced mediation and set the date for the dependency hearing for the end of January. In June 2010 Rifqa graduated from Focus Learning Academy. Tragically – on top of everything else she had gone through – Rifqa was diagnosed with advanced Uterine cancer during the last stages of the case and while becoming independent. She had three successful surgeries to remove the cancer. Rifqa was supposed to have chemotherapy for 45 Weeks, but she quit getting chemotherapy because the cancer treatments made her sick and weak and unable to focus on the case. Rifqa has been cancer free and she’s working with her doctors to make sure that the Cancer doesn’t come back. On August 10, 2010, Bary became 18 years old and Franklin County Children Services’ custody of her ended. She was now independent and free to practice her religion as an adult.